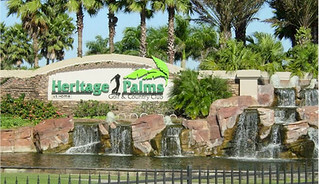 Heritage Palms Golf & Country Club is a prominent active golf community in Fort Myers, Florida. Established in 1999 by U.S. Homes, this gated community offers residents an array of affordable homes to choose from. Golfers of all levels can enjoy the two 18-hole championship golf courses, spread across the 800 acre community. Practice facilities include an aqua driving range, as well as a chipping and putting green to allow residents a chance to practice their game.Heritage Palms is an ideal Fort Myers retirement community. The 28,400 square-foot clubhouse overlooks a freshwater lake and is the hub for the community’s social events, fitness classes and clubs. The magnificent facility includes formal and informal dining, a library, locker rooms, and a heated outdoor swimming pool with a spa and a cabana. Love tennis? Then take advantage of the eight lighted Har-Tru tennis courts with stadium seating and a fully stocked pro shop. The Lodge is a second 5,000 square-foot clubhouse, a members-only facility, that offers even more amenities. It features a grand hall, billiards room, card room, library and computer room. There are also a variety of fitness classes and social activities for all residents. The Tiki Bar & Grill is the best place to meet for dinner and drinks. It allows residents to socialize while enjoying the resort-style pool that has a waterfall and spa. Find Homes for Sale in Heritage Palms Golf & Country Club or contact me with more questions. Posted on October 3, 2013, in Real Estate and tagged Bonita Springs Realtor, Cape Coral Realtor, Estero Realtor, Fort Myers, Fort Myers Realtor, Heritage Palms Golf & Country Club, Heritage Palms Realtor, Kristen Pell, Property Guiding, Real Estate Biz, SWFL Real Estate, The Pell Team. Bookmark the permalink. Leave a comment.